CHELMSFORD, Mass. 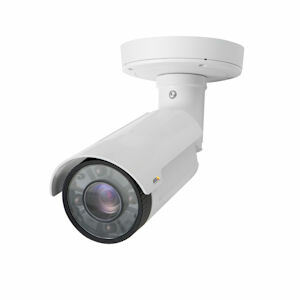 – October 15, 2013 – Axis Communications, the market leader in network video, today announced a strong addition to its line of fixed cameras for around-the-clock outdoor surveillance with AXIS Q1765-LE Network Camera. AXIS Q1765-LE with built-in infra-red (IR) LEDs and outdoor-ready enclosure has a powerful 18x motorized optical zoom with autofocus for covering long distances in crisp and clear 1080p HDTV resolution (see video). The bullet-style network camera was designed for monitoring entrances, exits and perimeters as well as parking lots and city streets with pole mounting options. The high-efficient, automatically adaptive IR LEDs inside AXIS Q1765-LE cast enough infra-red light in darkness to allow the camera to see at least 50 ft. away in the widest field-of-view and up to 130 ft. in full tele view. This intelligent, built-in IR illumination automatically adjusts its beam to match the camera’s field-of-view, making it especially beneficial for installations requiring around-the-clock surveillance without additional artificial lighting. Axis’ unique Corridor Format also allows for effective monitoring of long, 9:16 vertical scenes such as highways and city streets for traffic monitoring and fence lines for perimeter security. The compact AXIS Q1765-LE is lightweight yet tough. The camera is IP66/NEMA 4X-rated, making it resistant to water and dust. Arctic Temperature Control allows reliable start-up in temperatures ranging from -40°F to 122°F, making AXIS Q1765-LE perfect for installations in places with challenging weather. The camera is easy to install thanks to its lightweight design, one-cable installation and support for Power over Ethernet and AC/DC power (see video). AXIS Q1765-LE Network Camera will be available in Q4 2013 through Axis’ standard distribution channels at the suggested retail price of $1399. ● Ability to easily integrate the camera with existing security systems. AXIS Q1765-LE is compatible with the industry’s largest base of video management software through the Axis Application Development Partner Program and is also supported by AXIS Camera Station. The camera includes the AXIS Camera Application Platform for application developers to provide the camera with intelligent capabilities, AXIS Video Hosting System for simple connection to hosted video systems and compliance with the ONVIF standard for easy camera system integration.